Xiaomi has been teasing the Mi 8 Youth smartphone from the past few weeks. It will be officially unveiled tomorrow in Chengdu, China. The teaser videos already revealed the Mi 8 Youth to come with gradient finish body. 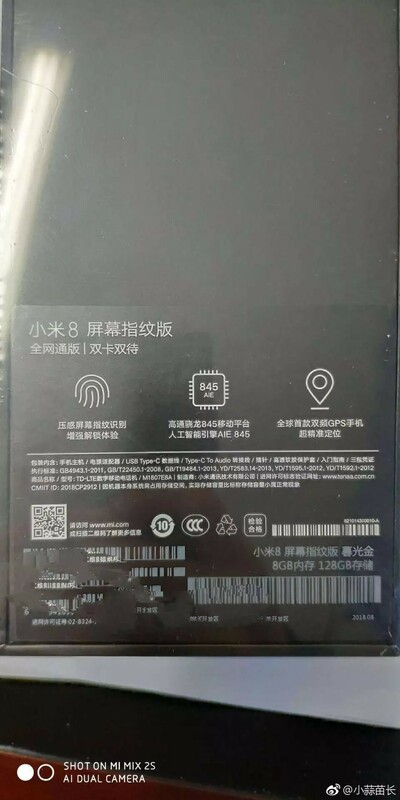 Now, the leaked images of the retail box also confirm the company’s plan to launch the Mi 8 in-display fingerprint variant. The Mi 8 Explorer variant launched alongside the Mi 8 in May this year came with an in-display fingerprint sensor and transparent back. Now, the new variant of the Mi 8 will be coming with an in-display fingerprint sensor and gradient finish. Apart from these two changes, the Mi 8 in-display fingerprint variant will also come with 8GB of RAM and 128GB of internal storage. The Mi 8 launched earlier this year came only with 6GB of RAM. On the front, the device sports 6.21-inch notch display with Full HD+ (2248 x 1080 pixels) resolution and 18.7:9 aspect ratio. Under the hood, the devices come powered by Qualcomm Snapdragon 845 Mobile Platform coupled with Adreno 630 GPU and 8GB of RAM. In terms of optics, the Mi 8 in-display fingerprint variant sports 12MP dual rear cameras with 4-axis OIS and a 20MP single front camera with f/2.0 aperture. This new device will also continue to feature Dual-frequency GPS for more accurate location detection. Stay tuned on PhoneRadar for more details!